With Christmas just around the corner, it’s time to start thinking of ways to reward your loyal clients, patrons and employees. Premium Christmas Wreaths offers an extensive selection of amazing corporate gifts that are all guaranteed to please! Free from the common worries of finding a gift that respects food allergies, dietary restrictions and personal preferences, our fresh Christmas wreaths and decorations are always a great way to make an impression. In this post, we’re going to look at the top five corporate gifts available this season in our online shop. A stunning seasonal plant, the Red Amaryllis features multiple blooms and can be replanted year after year. Inexpensive and easy to ship, it’s a great choice for any company looking to buy gifts for a large number of valued customers. Another inexpensive option, our traditional swag is a good way to help your clients kick start their Christmas decorating. With lush, natural greens and vibrant winterberry accents, a little swag adds a touch of holiday spirit to every room. A memorable option, our miniature boxwood trees are an unforgettable way to wish your clients a merry Christmas. Perfect for conference room tables or reception rooms, your company’s customers are sure to appreciate this unique, thoughtful gift. There’s no quicker way to brighten up the office space than with the cheerful colors of this winterberry bouquet. The perfect preseason gift, our Oregonia winterberry bouquet is a fragrant, luxurious way to thank your company’s top clients. 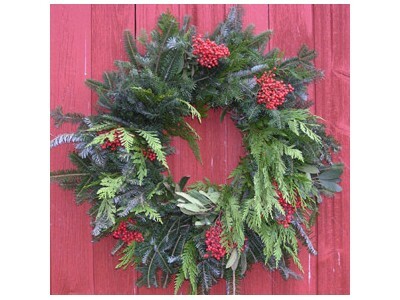 Of course, we top off our list with our namesake item, premium Christmas wreaths. In our online shop, we offer a large assortment of fresh Christmas wreaths for delivery, including a number that are ideally suited as corporate gifts. If you’d like help selecting the perfect gift for your company’s clients, contact us today and we’d love to discuss your options.